As Sender-Device, we denote the device on which this app is started as Sender. Typically, the Sender-Device is placed in the baby's sleeping room. 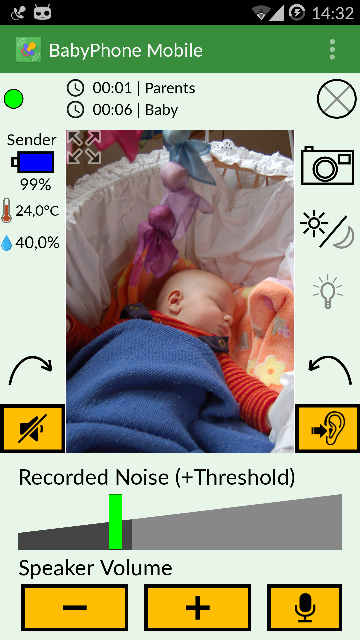 The Sender-Device records a number of data such as the loudness of the baby and transmits this data to the Receiver-Device. As Receiver-Device, we denote the device on which this app is started as Receiver. Typically, the Receiver-Device is carried along by the parents or placed near the parents. It serves mainly for receiving the data transmitted by the Sender-Device and presenting this data to the parents. 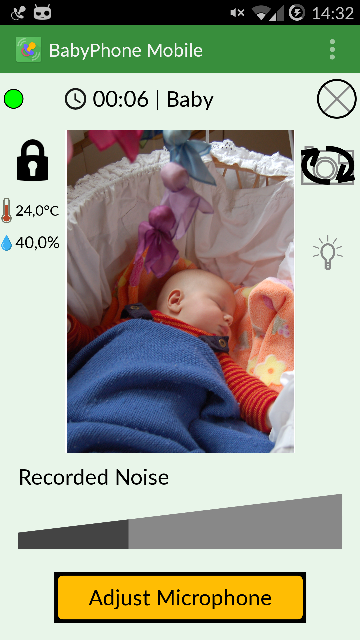 On the Sender-Device, the app accesses the microphone for recording the sound level of the surrounding environment that it then transmits to the Receiver-Device. Further, audio is recorded and transmitted to the Receiver-Device where it is played back, such as when the baby cries. Microphone data is not stored permanently. If the Sender-Device has a supported temperature sensor or humidity sensor, the temperature and humidity of the surrounding can be recorded. This data is transmitted from the Sender-Device to the Receiver-Device where it is presented on screen. The latest transmitted sensor values stay active on the Receiver-Device until they are overwritten by new data or until the app is closed. Sensor data is not stored permanently. Battery level is monitored on both the Sender-Device and Receiver-Device. Doing so, a warning can be shown in case battery level drops below a predefined limit. Further, the battery level of the Sender-Device is transmitted to the Receiver-Device where it is presented on screen. The latest battery level received stays active on the Receiver-Device until it is overwritten by new data or until the app is closed. Battery level data is not stored permanently. The app is intented to by used within a private and secured network, such as at your home. Therefore, the transmission of data is unencrypted. In order to ensure the functionality of the connection between the Sender-Device and Receiver-Device, small status messages are transmitted between the two devices regularily. This supports for the quick detection of connectivity issue and the notification of the user about such issues with a warning dialog. The connectivity status is not stored permanently. The Receiver-Device can automatically discover the Sender-Device on a network with the help of Multicast. Doing so, the Receiver-Device broadcasts a respective message to the network and the Sender-Device responds with its IP. The Sender-Device responds to respective messages only if it is not currently connected to a Receiver-Device. The Receiver-Device stores the IP of the last Sender-Device it was connected to in order to ensure a faster connection on its next start. The app can access the WiFi state of the respective device. Thus, the app can active or deactivate the WiFi adapter and it can establish a direct WiFi connection between the devices. Doing so, the app has no access to the password of the regular WiFi network. With this permission, the app can activate the WiFi adapter once it is started as Sender or Receiver, for example. If the app was downloaded and installed from our website, the app may include an update check feature. Thereby, the app can check for new version by querying our server. A respective message about new versions is presented to the user. If the app was downloaded through an app store, the update policy of the respective app store is in effect. Please contact the respective app store for further information on the respective update process and the data collected and stored within this process. 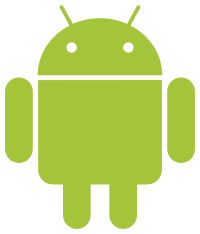 The app provides you with the opportunity of informing us about bugs or sending us feature requests. Doing so, an e-mail template with our e-mail address as receiver is shown. In order to send us bugs or feature requests, you enter this information in the e-mail template. By sending the e-mail, the information is transmitted to us. Because this is a normal e-mail, we will see the e-mail address that you sent the message from. Properties can be changed within the app. Examples are the playback sound level or transmission duration of videos. Those properties and settings are stored locally on the respective device. The app is offered through a number of app stores. The app stores manage app downloads and purchases by themselves. Please refer to the information provided by the respective app stores on which data they collect and how they process data. We use several advertising networks for the presentation of ads. Those networks use the advertising ID of the respective devices, for example. We use the following advertising networks: Google Admob, Facebook Audience Network, Flurry, AppBrain, and InMobi. Please refer to the privacy policies of the respective advertising networks for further information on how they process data.